Throughout the South Yorkshire Poetry Festival we will be showcasing 5 exhibitions, all with strong poetic themes or inspiration at their heart. The poetry by Harriet Tarlo and the paintings by Judith Tucker emerge from an extended series of poems, drawings and paintings made in response to a commission from Linda Ingham, curator of the Excavations and Estuaries project. The poet and artist responded to the landscape between Cleethorpes and Tetney on the Humber estuary, visiting regularly between Spring 2013 and Summer 2014 and continue to do so. Sara Maitland, in Gossip from the Forest, suggests that the difficulties with fairytales relate to the landscape they emerge from. For us, it’s the forest – the dense chaos of branches, sunlight and shadow informs the narrative, providing the possibilities of wolves, woodsmen, the dispossession that comes with losing our way, and what it might take to find the path back to ourselves. The forest is more than a setting, and our fairytales hold more than they seem to. The Frome Primer is a sequence of twenty-four poems and photographs by Andrew Hirst and Brian Lewis, first exhibited in 2008. Hirst originally conceived the work as ‘a view of the south from the north’, an allusion to the distances that informed its development; Hirst was based in Sheffield, while Lewis was photographing the landscapes of southern England, sending images back to Hirst without situational or geographical context. In Twenty-Five Views of Japan Helen Tookey starts from a previously existing text – a 1930s account of a year spent in Japan – and creates from it a sequence of 25 four-line collage poems. These in turn become the starting-points for a set of 25 collage images by poet/artist Patricia Farrell. Playing with the idea of ‘views’ of a place not actually visited, the poems and images hint at, but never quite resolve into, miniature narratives of an imagined Japan. 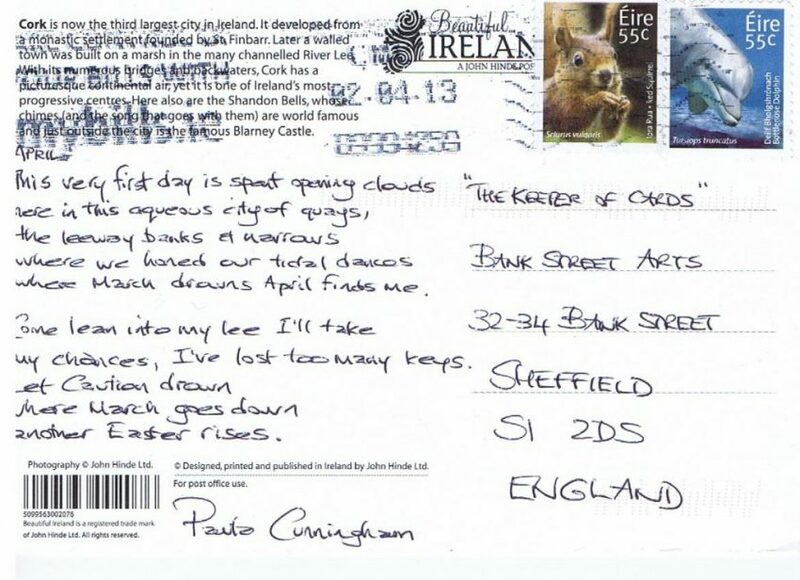 The original Postcard Poems project has been extended into a competition for this year’s Poetry Festival. Poets were invited to send a picture postcard – from home, work, or somewhere they had visited – featuring an original, handwritten poem ‘that relates in some way to the location of the postcard’. This could mean the place or time, or simply the fact that it was written by that person, in that location, at that moment.